Domaine de Villeneuve was owned by the Arnaux family until they sold it to Philippe du Roy de Blicquy and his business partner, Stanislas Wallut in 1993. Ten years later in 2003, Stanislas Wallut purchased his partners shares and became the sole owner of Domaine Villeneuve. At the time of the initial purchase Domaine de Villeneuve was in poor condition and needed extensive, work in the vineyards and wine making facilities. The domaine takes its name from a tiny village, located just over the bridge, that leads to and from Avignon. The wine making facilities and cellars were completely rebuilt and are now some of the most modern cellars in the Southern Rhone. The new winery was built under-ground taking up 3 different levels. The reason this was done was to create a winery where everything moved by gravity. One of the other early decisions was to hire Philippe Cambie to consult the estate. All work in the vineyards is done using only biodynamic farming techniques. 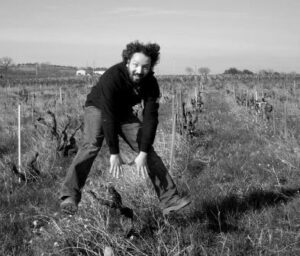 Domaine de Villeneuve has been certified biodynamic by Ecocert and Biodyvin. Domaine de Villeneuve owns 8.4 hectares of vines in the Chateauneuf du Pape appellation. The vineyard is perfectly located in the north of the appellation, not far from Chateau Beaucastel on one side and with Mont Redon on the other. The vineyard has old vines that range from about 30 years of age on the young side to more than 100 years old. Their best terroir is in the Palestor lieu-dit. The vineyard is planted to 70% Grenache, 16% Mourvedre, 8% Syrah, 4% Cinsault and 2% Clairette. The terroir ranges from sand to small rocks and stones to red clay in the soils. Domaine de Villeneuve produces 2 Chateauneuf du Pape Rouge wines. Domaine de Villeneuve Les Vieilles Vignes – The wine is made from a blend of 70% Grenache, 16% Mourvedre, 8% Syrah, 4% Cinsault and 2% Clairette, a white wine grape. The wine is produced from 8.4 hectares of vines that average 40 years of age. Vinification takes place in red, cement tanks. The wine is aged in a combination of vat, demi-muids and old barrels that range in age for an average of 18 months before bottling. Slightly less than 2,000 cases of wine are produced each vintage. Domaine de Villeneuve Habemus Papam – The wine is made from blending 80% Mourvedre with 20% Grenache. The wine is vinified in tank and is then aged for an average of 20 months in large oak vats before bottling. The production is small. It is also important to note that Domaine de Villeneuve Habemus Papam is only bottled in magnum. Domaine de Villeneuve Cuvee des Bien Iames was is no longer in production. The wine, made for only a few vintages at the most was more of an experiment, especially when it came to the aging, as the wine was aged in almost 100% new, French oak barrels. Today, the estate is moving further away from barrel aging. Domaine de Villeneuve can be enjoyed on the young side. Young vintages can be popped and poured, or decanted for about 1 hour, give or take. This allows the wine to soften and open its perfume. Older vintages might need very little decanting, just enough to remove the sediment. Domaine de Villeneuve is usually better with 2-7 years of bottle age. Of course that can vary slightly, depending on the vintage. In the best vintages the wine should be consumed within 4-15 years after the vintage. Domaine de Villeneuve is best served at 15.5 degrees Celsius, 60 degrees Fahrenheit. The cool, almost cellar temperature gives the wine more freshness and lift. Domaine de Villeneuve is best served with all types of classic meat dishes, veal, pork, beef, lamb, duck, game, roast chicken, roasted, braised, stewed, and grilled dishes, smoked meats, barbecue, sausage, cassoulet, eggplant and tomatoes. Domaine de Villeneuve is also good with Asian dishes, hearty fish courses like tuna, mushrooms, pasta and cheese. Deep in color, the wine offers concentration, freshness and lush textures. Silky ripe fruits, with salty tannins, black cherries and a creamy finish are what you'll find in the end notes. The wine is produced with a preponderance of Grenache, along with other, allowable, assorted grape varieties. Medium bodied and focused on its fresh, bright, red berry character, with plenty of pepper, herbs, earth and spicy cherries to go around. From yields of just 10 hectoliters per hectare, this rich, concentrated, garrigue filled fine delivers fresh, black cherries, liqueur, spice and fat, lush textures. Consulted by Philippe Cambie. Nice, early drinking, medium bodied, soft wine with fresh, sweet, jammy black raspberries, pepper and garrigue. Ready for prime time drinking with layers of fresh, sweet, ripe, juicy, dark red berries, jam, pepper, garrigue and lush textures, finishing with a powerful blast of jammy black raspberries and licorice.